Looking at a map and selecting all the locations you want to visit is the fun part. Putting down dates and making plans is also exciting. Then reality hits… you need to make a budget and understand what it costs to travel. Don’t worry, just like you we hate to see numbers. Many people have asked us, how much does it cost to travel longterm? I really wish we had the answer to that question. My best response to that is “it really depends on you, your traveling lifestyle, and how long you want to travel for”. Before we start talking about the cost of traveling, we need to understand the most common mindset of traveling. Most of us are accustomed to short term travel which is expensive. If you look at how much you spend for a 1 or 2 week vacation, the costs add up quickly. Long term travel and short term travel are very different. Before starting our travelmoon, we vacationed for 7-14 days at a time. During this time, we tried to fit in as many experiences as we could. Our trips to Cancun always included an all-inclusive hotel since we did not have the time to go search for lunch or dinner. We decided to invest our time and money in tours and activities. It is crazy to think that we used to allocate $80-$100 per day/per person for tours and activities. Time was not on our side, so we never attempted to really negotiate prices and just wanted to make sure we filled up our days with memorable experiences. So what is the difference with long term travel? You travel at a slower pace. The longer you stay at a place, the less expensive it is. You are not spending on transportation costs as frequently. For example, you might be in Madrid, Spain for one month versus one week. This allows for the transportation cost to be spread over 30 days, not 7 days. Another big difference is that you are not maintaining a lifestyle back home. When you travel short term, you may have to go home to rent, insurance or cell phone bills. As long term travelers, we had to eliminate or minimize those expenses. Long term travel is not as expensive as people might think, but it does take preparation and discipline. We had to leave some habits behind and adjust to our new mindset of budget traveling. Below you will find the most important things we had to take into account to prepare for our long term trip. This step is really important because it will help you get a better idea on how much money you will need for your travels. Lorena and I sat down one day and made a list of all the places we wanted to visit and things we wanted to see at each place. Knowing were you want to go and why will give you a good starting point to find out how much money you will need for your travels. While you are creating the list of places you want to visit, prioritize the list and determine the "must see" places. Some of the places you thought were on your bucket list, might get completely eliminated after finding out they are expensive or not the place you imagined it would be. 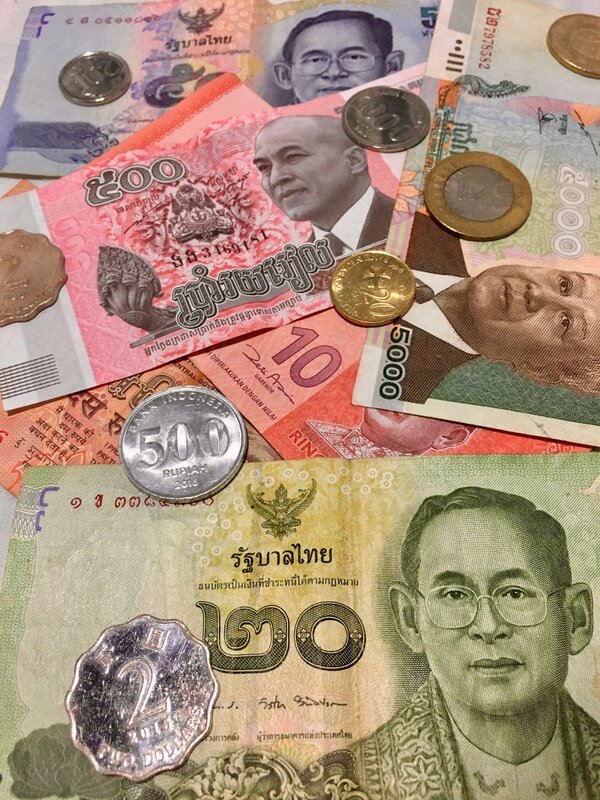 Traveling in Europe will be drastically more expensive than traveling in Southeast Asia. You can get an Airbnb with a private room in Rome, Italy for $72USD a night, but if you travel to Bali, Indonesia you can easily find a guesthouse with breakfast for $11USD per night. Researching the estimated cost of the place you want to visit will help you get a better idea of the budget you will need. What do we use for research? There are many online resources to help with research on places to visit. You can visit numerous travel blogs, Pinterest, Trip Advisor and there are some great Travel Facebook Groups. Google is still our best friend. So where will you stay? Are you looking for a 5 star hotel? Willing to rent a private bedroom or share a room with 10 other travelers? This is definitely one of the largest cost and can make or break your budget. It would be lovely to stay in a nice hotel with all the bells and whistles. Lets be honest here, are you really going to use all the facilities the nicer hotels have to offer? When you pay a higher rate, you are essentially paying for those additional features. My question to you is “do you really need them”? When we travel we are mostly looking for a place to store our stuff, sleep and shower. We rarely spend a lot of time in the hotel. If you go to the other side of the world, do you really want to be by the pool or sitting down using the wi-fi in the beautiful lobby? I am sure some people might say yes, but for us it is a definite NO! Instead, we tend to book cheaper accommodation and use the extra money on experiences. You will not believe the amazing spots we have found online at a fraction of the cost of those fancy hotels. What is the difference? Most of our stays are in small boutique or guesthouses that are not operating from a huge and fancy building. The locals have converted their homes into guesthouses and are able to offer you a very reasonable price. We have had some of our best experiences in these types of hotels. We have also met some incredible people that will go out of their way to make sure you enjoy it and tell your friends. Most of the guesthouses range from $10-$25 per night and some even include breakfast. (Make sure to do your homework and look at travelers reviews. We have found reading reviews is very helpful when booking a place.) So, why are you staying at the fancy hotel and paying over $100 per night? Are those fancy facilities better than walking in the rice fields of Ubud or exploring the beautiful white temple in Chiang Rai? What do we use to book our accomodation? We love booking accommodations on Airbnb and Booking.com. In Europe we were better off booking on Airbnb since it was two of us and the price was less expensive than a hostel for a private room and the use of the kitchen. Having an Airbnb with a kitchen allowed us to cook at home saving us money. In Asia, we were booking accommodation through Booking.com. We were mainly staying in hostels with a private room or a guesthouse. If you are traveling solo, this might be your best bet! Book on Booking.com using link below, and you’ll get $25USD after your trip. Are we there yet? Choosing how to get to your destination can also take a dip into your budget or save you some dollars. I believe there are two types of transportation: the one that gets you to your destination and the one you use while at your destination. In our travels we have moved around by plane, bus, train, ferry, taxi, scooter and walking. Our preference for transportation is always the cheapest option. We have taken overnight trains in Thailand that give you a nice sleeper sofa and also saves you the expense of one night of accommodation. Overnight buses are also not a bad way to travel. Believe it or not, plane rides are sometimes cheaper than a bus! Always look at all of your options and never rule anything out. Be smart when planning. Does it make sense to save $20 and spend 30 hours in a bus or take a flight for 3 hours? As I stated before, we all have different traveling habits and some people may elect to take the bus. Once we arrive at a destination, how do we move around? Well, I'll tell you this much...growing up in Chicago, I never used the public bus or train. I actually had no idea how it worked. I would always drive everywhere and pay the big parking fee. As of today, I can say I am an expert in public transportation in almost all the cites we have visited. Heck, I remember taking a train in Bulgaria and figuring out my stop by looking at signs! Yes… you will have to get creative. Most of the big cities have a wonderful train and bus system. Please use it! Get familiar with the system and you will save a lot of money. You will blow your budget if you are taking taxis everywhere. In many places we have opted to rent scooters to move around a city. I will warn you, it does take some time to get comfortable with a scooter. Once you get the hang of it, you will not be afraid to drive around the city or island. I actually learned how to drive a scooter in India… if you can drive in India, you can drive anywhere in the world. Last but not least, we also get our daily exercise by walking to many spots. We got to a point that any walk under an hour is not bad at all. This is one of the best ways to experience and discover a new city. If we can save some dollars and get our daily exercise, count us in! Our #1 website to book cheap flights is Skyscanner.net. It makes it easy to look up the cheap flights in a variety of ways. If you don't know , select "everywhere" as the destination and it gives the cheapest flights based on the city you are flying out of. It also has the option to search months in advance. We use Rome2rio to find the cheapest way of getting from point A to point B. It compares buses, ferries, flights, and trains. It details the amount of time it takes to get to a destination and the cheapest website that offers the lowest price. "I am hungry, lets eat anywhere!" Wrong...if you want to stay within your budget, you need to look for the local food. We love to stay near the city, nightlife and all the great hot spots, but dislike paying the high prices for food. We usually walk a few blocks and done! We find local food at local prices. This has been the case in most of Asia. You will be surprised how expensive a soda, water or even an appetizer can be in a regular restaurant. We quickly learned that we can eat dinner for the cost of one soda at some of the local restaurants. It does take time and effort to ask around and find a place, but nothing worth having comes easy. Once you find a place and you like it… make it your home for dinner! 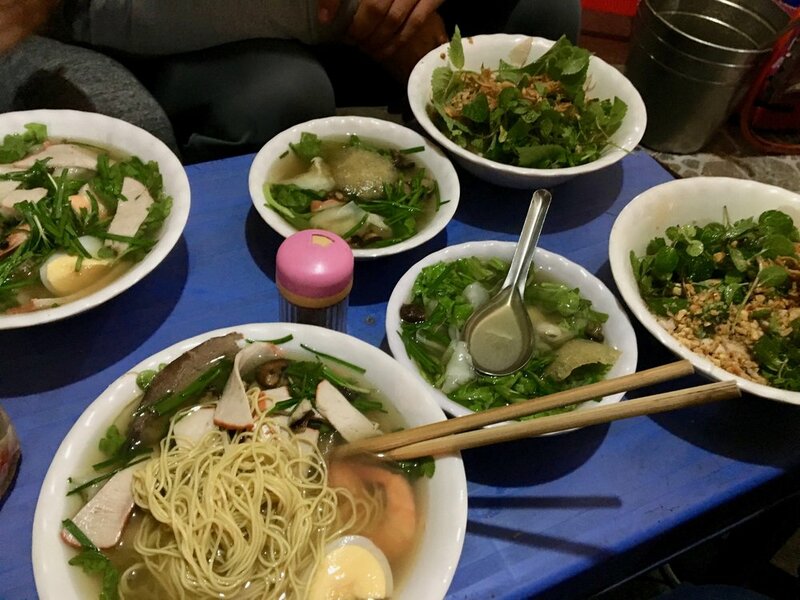 During our travels in Asia we had dinner for about $3-$5 for both. We are not eating in fancy restaurants, but our rule of thumb is follow the locals! If the place is full of locals, we usually give it a try. To this date, all the places we have chosen have not dissapointed! During our travels in Europe we cooked dinner at home. Since we visited most of the cities for about 7-10 days, we had the opportunity to visit a grocery store and stock up for the week. Snacks became a huge part of our day. We made sure to have healthy snacks and things that would fill us up until we got home to cook our dinner. We did splurge on a meal here and there, but there is no way we could eat out on a daily basis in Europe and meet our budget. For everyone that knows me, please excuse me for saying the following… BEER IS A WASTE OF MONEY! We all have a beer here and there, but when you are traveling you really need to be smart. As a long term traveler, I like to “plan my hangovers”. This does not mean we don’t drink, it means we are smart about it. It is very hard to justify having a beer randomly at 2pm when the cost of one beer is the same as your dinner. Again, I love to party and drink beer, but I have gotten smarter with my drinking habits. Drinking will kill your budget! You can spend in one night what you will spend to eat for the entire week… let that sink in. We always look for the best price in the local area and try to stay away from westernized food. The dingiest hole in the wall places were the locals eat always have the best food! That is were you will find us. Not only do you meet great local people, but you are also helping the local economy. After reading this you might still be asking “so…how much do I need to travel the world”? The approach we took during our travels was to continue using our daily habits from back home and just implement them during our everyday world travels. Did we live at a 5 Star Place in Atlanta? Did we have amazing dinners at fancy restaurants every day? Of course not! So why would we change our lifestyle while traveling on the other side of the world? I believe that if we chose to travel to other places in the world the same way we live back home, your experience will be different and you will get more from your vacation than if you spend all the money you saved. Because, that is what a vacation is right?